Getting your bearings after arriving in your new expat home can take time…so take your time. There is absolutely no need for you to have it all figured out the first week after you’ve landed. Take it easy, wander your new neighborhood, explore local stores and shops, keep your eyes up, and take it all in. This is your new home. As a newbie, you’ll have endless things to discover, but you won’t unearth them all right away. If you’re an American hoping to move to Scotland, obviously your primary concern is your visa situation. Americans are allowed to stay in the UK for up to six months within a 12 month period, with no visa required. So if your plan is a temporary stay to check it out and decide if you like life here, then you’ll be fine on the tourist visa granted at the airport upon arrival. You might be asked about your return flight if you declare on your immigration card that you’ll be staying the full six months. I was asked, although all I said was the date of my return flight and no further proof was required. You should have your booking confirmation handy though, just in case you need to show it. And, don’t forget, you won’t have internet access when you land in a foreign country! Take a screenshot of your pertinent emails or travel apps as needed. If you’re hoping to study, work, or otherwise stay in Scotland for longer than six months, you will require a visa. Be sure to investigate your own situation thoroughly to ensure a smooth arrival process. If you need a student visa or a work visa, your university or company should work with you to complete all your visa requirements in a timely manner. As with most countries’ immigration policies, the rules can be difficult to grasp and will vary case by case. Changing a visa status will have certain requirements, so be sure to check into that if you think you might stay to work after your student visa expires. Certain visas can only be applied for inside or outside of the country – be vigilant in reviewing the details relevant to you! Americans will find endless similarities between life back home and life in Scotland. They will also find countless differences. It’s those small differences that will make your life so much more interesting! Take note of the different flora and fauna. Marvel at the old buildings and beautiful architecture. Roll your eyes alongside your neighbors neighbours as the weather changes five times in an hour. Life in Scotland will beguile your senses in the best possible ways. You’ll notice familiar brands and labels for lots of food and clothing products…although you’ll notice little differences, like the fact that the store is called TK Maxx here. As with all expat homes, sometimes you just want that taste of home, so you’re willing to drive several hours or pay four times the normal price just to get it. That’s okay, too. Moments of missing home and wanting something to feel familiar are normal for all expats! Just remember that there are probably lots of local products that you’ll love as well. Don’t be afraid to give everything a try. 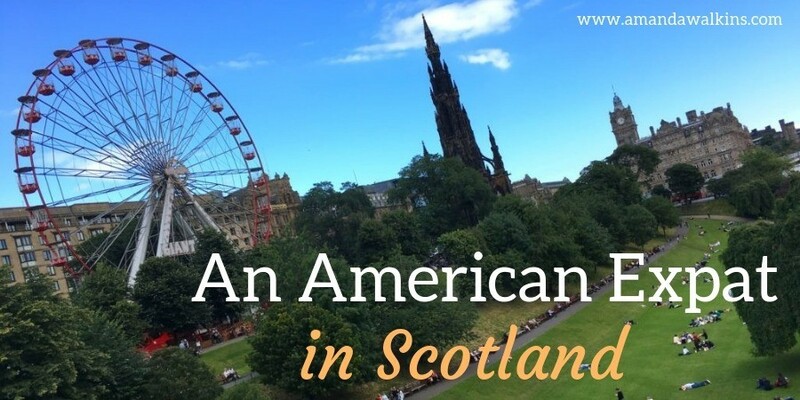 Luckily, throughout all these small changes you’ll face as an American expat in Scotland, language isn’t a huge issue. I say “huge” because it clearly can cause some confusion, but you’re still – essentially – speaking the same language as locals. You’ll be fine. Laugh about it when you get confused, ask questions when you don’t understand, and pretty soon you’ll be speaking in Scottish slang yourself! Just make sure you know which words and phrases are appropriate depending on your setting and audience. Finding a place to rent from overseas is incredibly challenging, so if you’re able, try to book temporary accommodations to allow yourself time to look upon arrival. We found that flats in Edinburgh move very quickly, so you could view several within a few days and be ready to move in immediately after. More rural areas obviously offer fewer options, but you might have more luck finding available places in advance if you reach out to real estate companies in the area. Another challenge you might face if you’re renting is your lack of local credit information. Some rental companies (they’re called letting agencies here, by the way) will ask for six months’ rent paid up front if you have no local financial information. If that poses too large a problem for you, you might be better off looking at a private rental. For that, head to the UK version of Craigslist: Gumtree. We did not have this problem when renting through ReMax for our first flat in Scotland, nor in renting with a local agency in Edinburgh called LinnMac. I’ve heard from others moving to Edinburgh that it can happen though. Utilities proved to be much cheaper than I anticipated. Our cell phone (ahem, our mobile) bill was only £10 each per month for unlimited texts, 150 minutes, and 1.5MB of data. With easy access to WiFi nearly everywhere, that’s plenty! We also weren’t bound by a contract, it was just a month-to-month payment plan. Similarly, our home utilities were much cheaper than expected, totaling less than £150 per month all included! Just don’t forget to pay your council tax each month and to obtain your TV license, if you need one. Those do add extra costs that I haven’t had in other countries. As an American expat in Scotland, adjusting to life here is fairly smooth and straightforward. You will adore the friendliness of locals, you will gape in amazement at the scenery, and you will have myriad adventures to enjoy as you explore your new expat home. You will find yourself immediately brought into the local fabric of the community here. The local butcher will get to know your name and your favorite orders. The bartender at your local (you don’t need to specify your “local pub” or “local bar”…it’s just called your local) will get to know you and chat as you order your pint. And it’s perfectly normal to chat with strangers on the bus or in the pub. Well, perfectly normal if they’re from an older generation. The younger generation is often glued to a mobile (which you now know is a cell phone). That, unfortunately, is universal. Life as an American expat in Scotland is easy. You’ll meet other expats if you join groups like InterNations, TravelMassive, or Facebook groups. You’ll easily make friends with locals no matter which part of the country you move to. And you’ll quickly adapt to the cadence of life in Scotland. You’ll lament the lack of sunshine with expats and locals alike, but you’ll learn to embrace every moment of summer warmth with BBQs in The Meadows and beer tents during festivals. Ah, the festivals. You will soon learn that nowhere else does festivals quite like Edinburgh! If you’re an American moving to Scotland, brace yourself to learn, to laugh, to drink too much, and to bundle up because those temperatures will never rise. You’d better just get used to them and get out there to explore! We moved to Scotland after leaving the island of Roatan, Honduras. While we have since left Scotland and moved to Malta, I still thought it might be helpful to share some insights we learned moving and living there. Connect with me on Facebook for more regular updates, and I’m also on Twitter, Instagram, and Pinterest. Let’s be friends!